America gave to the world ‘Comedy Roasts’ in 1904. In 2019, India & Mumbai is giving a new roast format - ‘INDUSTRY ROAST’. The Commune, a forum bringing ‘cool & ‘fun’ quotient to advertising, media and marketing communications fraternity, has conceptualized and organizing a CLEAN, FUN and BRUTALLY HONEST roast of professions. 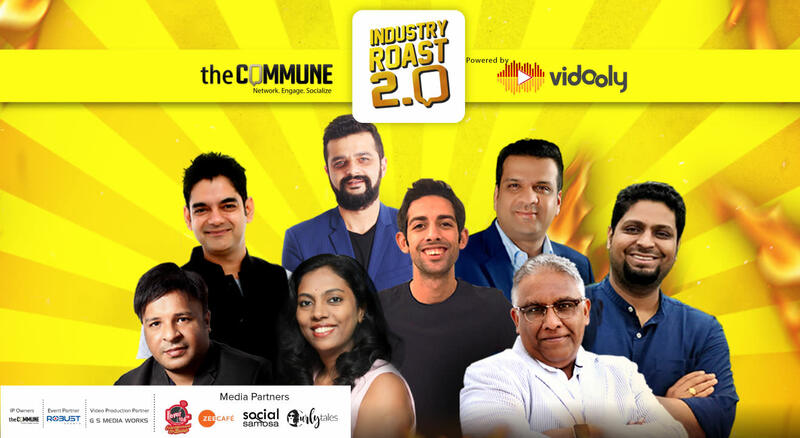 The Commune Industry Roast 2.0, powered by Vidooly, will see industry experts/stalwarts roasting and taking shots at each other’s professions (not each other) like Advertising, Marketing, Digital, PR, Media Planning & Buying and Journalism way along with stand-up comic as roast master. Entry gates to open by 6.30pm and roast begins sharp at 7.30pm. Pre-registrations needed due to a limited capacity. Event is managed by Robust Events along with G S Media Works as video production partner. Venue partner for the event is Cafe Zoe. Media partners are Zee Café, Fever 104 FM Social Samosa and Curly Tales. This INDUSTRY ROAST is happening for the second time after a successful first pilot edition held in January, 2018 with more than 110 attendees. The Commune is India’s only forum bringing ‘COOL’ and ‘FUN’ quotient to Advertising, Media and Marketing Communications industry through uniquely curated experiences and gatherings. Founded in 2016, The Commune aims to bring together professionals from Advertising, Marketing, Digital, PR, Media Planning & Buying, Content, Journalism and market research, among others on a single platform. This is India’s only multi-media platform bridging the gap between different functions and professions through curated and engaging gatherings such as INDUSTRY ROAST. Over the last 3 years, The Commune has organised six editions with a total of 700+ professionals attending the same. INDUSTRY ROAST is an IP owned property of The Commune, conceptualised in 2018. This is worlds and India’s first ever unique roast format of its nature based on professions.